I’ve grown bored of my original homepage’s look and feel and I’ve been meaning to build a theme of my own for this blog so I’m combining the two projects. 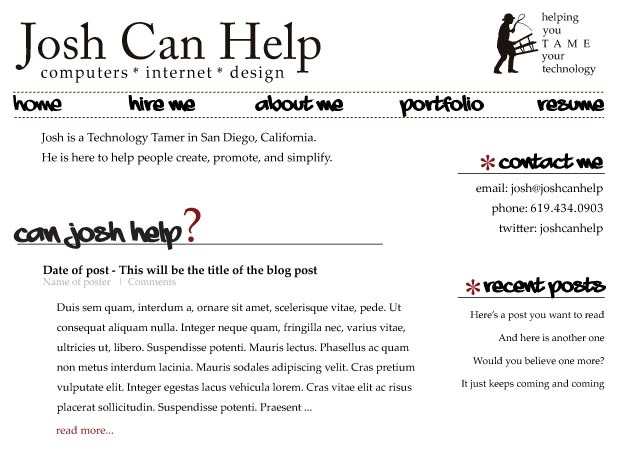 When I’m complete, joshcanhelp.com will point to a home page on this blog, directing people to information about me and what I do. Homepage is getting zero hits monthly, this blog gets several hundred. To get through this long process without driving myself crazy, I’m going to use an excellent web site design guide I found a while back. It’s called, appropriately, 12 Steps to Creating a Professional Web Design and it’s by Matt Jurmann. Though I’m new to the web design discipline, I’ve always had an organized mind and like walking through a process step-by-step rather than smashing my way through it. Matt’s article puts all the important steps in a logical order and presents it very accessibly. I’ve worked almost exclusively with non-designers on the web, email, and print projects I’ve been involved with and this step is always conspicuously missing. Don’t get me wrong, I’m definitely part of the problem, but two people on a mission without a concrete plan or idea of what they’re trying to communicate is a recipe for disaster. I need, first and foremost, a digital business card. The most important reason this website exists is to get me new clients and make new connections on-line. For this reason, the fact that I’m for hire and my contact information needs to be present and somewhat prominent everywhere. The clients that I want/expect are not going to be greatly technologically savvy. As such, everything needs to be easy to use and easy to find. Form MUST take a back seat to function; this is not so much a creative outlet as it is a funnel for the technologically challenged. Because I like to write and my writing brings clicks and new people, the blog feed needs to be prominent on the site and be an integral part of the process. I want to post news, happenings, hirings, new projects, completed projects, design inspiration, and how-to guides. Anything new added to the site will likely end up being posted on my blog at the same time. I need a place for my resume (I have a page for now). This includes experience, qualifications, mad skills, recommendations from LinkedIn, and completed projects. The site needs to generally match the style of my business card. Either white or off-white background with a concentration on typography and simplicity. My target audience is not designers or tech-savvy people so I want a layout that’s very easy to use and visually appealing. I made a quick sketch in the car during a recent trip. Everything with an underline is it’s own page. You can see that this is going to be a nice, simple website. I don’t want a lot of pages to manage and if I need to add content, I’ll add it as a blog post and link to it. I want my concentration to be on adding posts and blogging about the work I’ve completed. I also want potential clients to be able to scroll through my work quickly and only read more about the ones that interest them (links to posts). The next step is mocking up the pages and figure out how everything is going to come together. I’m not completely sure but I have a few ideas. Here’s my first draft for the layout. Comments on style and usability are always welcome. I see a few things to change already but so far so good! Start moving content into the blog before any design begins. I want to get the copy finished and formatted before I move forward with the theme creation. 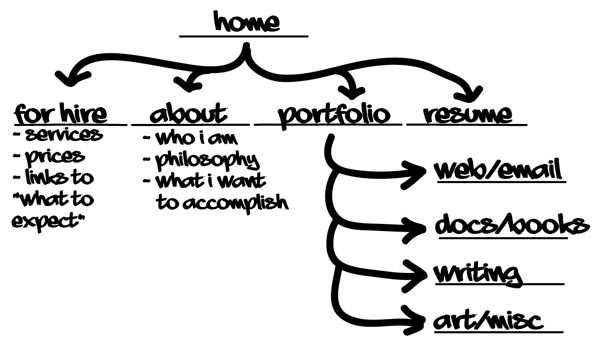 This is just the home page; work still needs to be completed on all the other pages, particularly the portfolio pages. Find a blank or simple theme that I can start working with. Next post: finished home page and portfolio designs! Edit: I future-posted this and have completed a few of these items and taken the deign in a different direction (the one above it too “Josh” [if you know me then you know what that means]).